a business-to-business debate chaired by TV presenter Andriy Kulykov with business leaders Petro Poroshenko (businessman, politician and head of National Bank Council) Mohammed Zahoor (Head of Istil Group), Roger Munnings (Catalyst UK) and David Hill (JCB), attended by Ukrainian and British leaders and followed by a press conference. 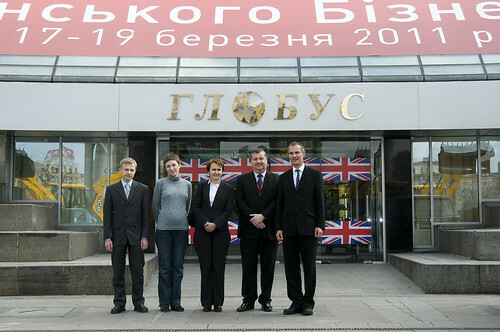 a gala launch of a major exhibition of British business and brands in the Globus shopping centre in central Kyiv, attended by the head of the City Administration, Mr Popov, and many political and business figures. a meeting between British business leaders and Prime Minister Azarov to discuss measures to improve the business climate. the opening of the exhibition in Globus to members of the public on 18 and 19 March. I am delighted that the feedback from the British and Ukrainian business community to all of these events has been strongly positive. A number of exhibitors tell me they have received concrete and significant orders as the result of the exhibition. All were delighted to meet and talk with Prime Minister Azarov. My thanks go to all our partner organisations for their hard work and support; and to our commercial team here in the embassy (pictured below) for making it happen.